This recipe was inspired by the one tablespoon of Ceviche prepared by Mary Sue Milliken that I had at the Cadillac Culinary Challenge in October. It was served in a little plastic glass, but the taste impact of the Aji Amarillo Pepper Sauce was so profound I had to try to make it myself. I can’t remember the last time I experienced a totally new taste or ingredient, but this was definitely one of those times. I watched her prepare the ceviche and listened carefully as she explained the recipe as she went along. 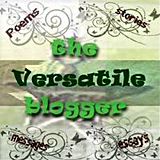 As I prepared my version I wrote down the amount of each ingredient I used and was very satisfied with my end result. More than satisfied, I was ecstatic. Chef Mary Sue used Red Snapper in her recipe, but I chose to use a less expensive (think cheap) fish called Swai, which is a fresh water Catfish from Vietnam found in the Mekong River Basin. I, however, bought it frozen at Ralph’s Market. Each fillet was individually frozen in cryovac, and thawed quickly in a warm water bath. 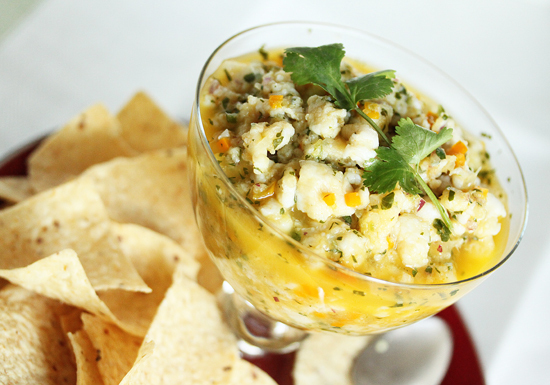 Ceviche is fresh raw fish that is “cooked” by marinating in citrus juice, usually lime juice. The proteins in the fish are denatured by the acid in the juice, which means their chemical bonds come apart. It is the same chemical undoing that happens when meat, fish or eggs are exposed to high heat. I found the jarred Aji Amarillo Peppers and the Aji Amarillo Pepper Paste at El Gaucho Latino Market in Manhattan Beach. They have a whole panoply of South American items, including Peruvian beer. I asked the checkout lady if she cooked with the Aji Amarillo peppers and she said to go on the computer and look up Aji de Gallina. So I did, and it turns out to be one of the Peruvian national dishes, made with chicken, evaporated milk and the Aji Amarillo peppers. Peruvian cuisine has been influenced by immigrants from Spain, Africa, China and Japan. Many recipes might be familiar because they are a twist on Japanese dishes. Like ceviche. Raw fish. There is an interesting article in The Wall Street Journal about Peruvian food being “The Next big Thing.” If you live in Los Angeles, have you been to Mo-Chica or Picca, two of our Peruvian restaurants? I see them in my near future. This is the way my plate looked when I actually ate my Ceviche. I loved the Aji Amarillo Pepper Paste so much that I put some in a little bowl to be spooned onto the tortilla chip before piling on the ceviche. Just a small smear, however, because it does have significant heat and will make your nose run. But the taste is so sublime, it’s worth it. 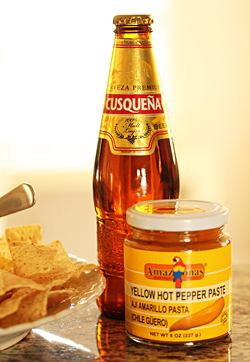 Fete your Holiday guests with Aji Amarillo Ceviche and some Peruvian Cusquena Malt Lager Beer. They’ll never forget it and they will love you forever. 1. 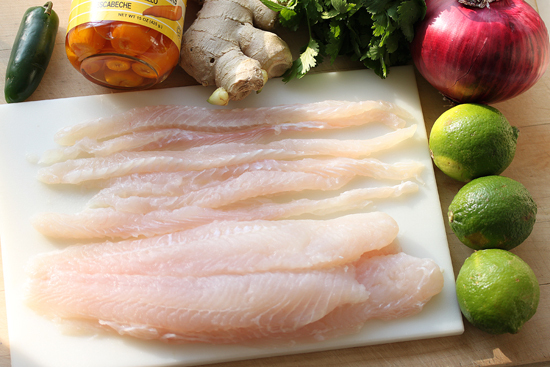 Cut the fish fillets into ½-inch strips length-wise, then across into ¼-inch pieces. In a large bowl, combine diced fish and lime juice, making sure the fish is completely submerged. Let marinate for 20 minutes at room temperature, or up to 3 hours in the fridge. 2. Drain fish, reserving lime juice. Add the remaining ingredients to the fish along with ½ cup of the reserved lime juice. Place in a serving bowl surrounded with tortilla chips. Note: If you like the heat of the Aji Amarillo Pepper Paste, serve with a small bowl of the paste with a little spoon, to put a small smear on a tortilla chip along with the ceviche. Mmmm this is such a great recipe! 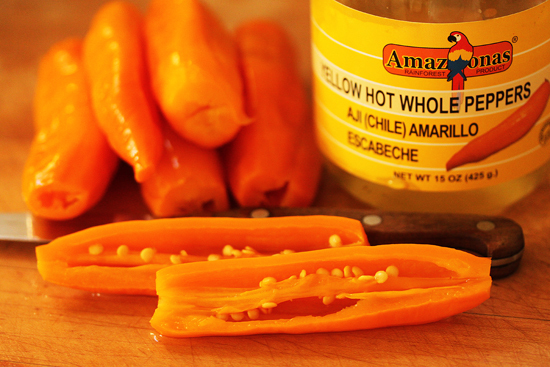 If you love Peruvian dishes, please try out my aji marinade for chicken. I think you’ll really enjoy it! This looks Amazing!! 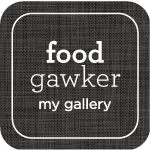 I’m definitely going to try it – soon! I’ve always wanted to try making ceviche! It sounds so complex but also fresh and delicious. Looks wonderful, and I have been to Mo-Chica and had Cusqueno beer in Cusco. It’s the main beer in Peru. Picca (same chef as Mo-Chica) is on my list! Don’t you just love it when you can recreate a recipe that you’ve enjoyed? Thank you for teasing me with this post. I’m hungry now! I hope you have a lovely end to your week. I can’t believe it is already Thursday! Hugs and love from Austin. What a beautifully delicious looking ceviche! I’ve never made it but I always order it when I see it on a menu. Yours looks quite easy to make. Good recipe!! I like it with french bread, instead of tortilla chips. 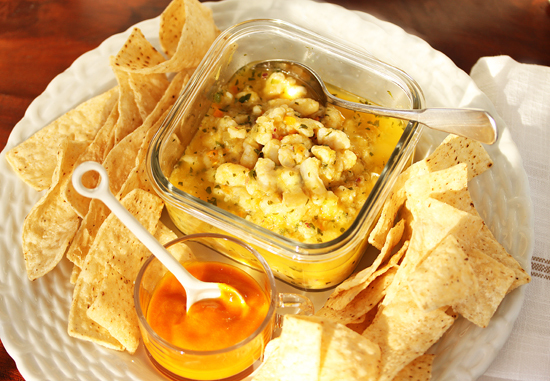 One little correction on the aji de gallina, it is not made with condensed milk, it is made with evaporated milk. Condensed milk has lots of sugar. Looks good! Except Peruvian ceviche would never be with eaten with tortilla chips, those are Mexican so a huge no-no. 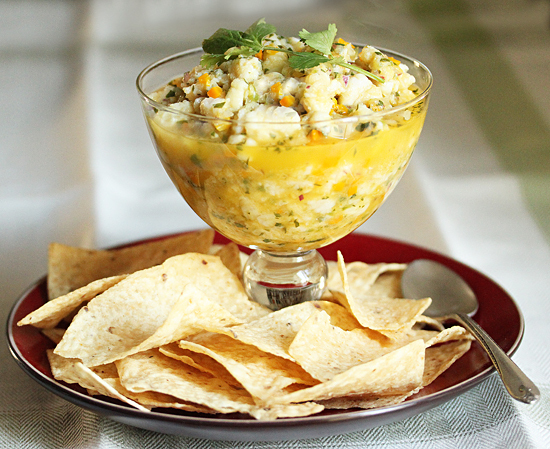 Peruvian ceviche is sufficient eaten with just a fork, maybe cancha! I’ve had ceviche alone, with cancha, and with chips. I’m always happiest with chips. Chips are great at picking up ceviche and the combination of tortilla chip crunchiness with ceviche is the most satisfying. Things don’t have to be 100% authentic all the time. Just delicious!